The dining room was the hub of activity for our house. Big dinners were everyday occurrences. By this time Ted and Jean Bloch had arrived to stay two weeks–that was a month ago. Jean and my mother worked things out well in the kitchen. I loved being in the kitchen with them as they planned the shopping list along with the ration stamps. My job was to set the table. It was to be for 8 this evening. It was a usual family dinner except this time it was Thanksgiving. We all were gathered round the long dining room table. A man walked into the dining room, “Good evening, It looks like a delicious meal.” He said. “Happy Thanksgiving.” my father replied. The man walked around the table checking out the turkey, vegetables and olives. As he walked by me, he put his hand under my chin and raised my face to look at him. He did the same thing with my brother. “Who was that?” Ted asked. “That was Mr. Boyer. He comes to see Miss Peabody who is currently staying in the third floor apartment.” My mother explained. “We can’t go up the stairs to the third floor. That is off-limits.” I added. When dessert came it was that wonderful chocolate cake that mother made with the icing my brother and I liked so much. I the habit of taking off the icing to save it and eat it last. “Jannie, you should eat the cake and the icing together.” My father requested. “But, Daddy.” I said as my father reached over to take the icing off my plate and eat it himself. I started thinking after the meal was over about how much I liked the dining room. It was a room full of surprises. One time I came in while my parents were having a party in the living room. The dining room was dark. I saw a man lying under the buffet. When I asked my mother she told me that was Buster, a friend of the family. He was fine. He was just tired and was taking a nap and that I should not wake him up. Tommy and I raced to the window and saw nothing. “April Fool.” My father replied. 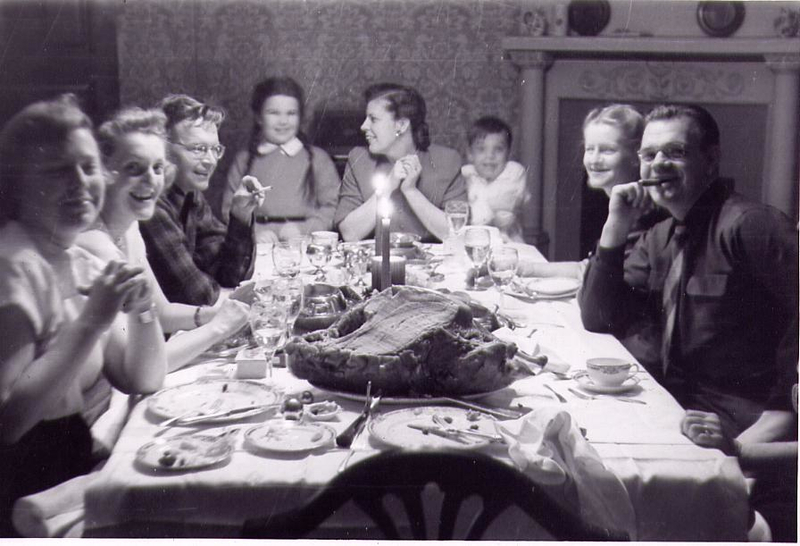 Sometimes when my mother had really big parties, we put another table next to the regular one. Then put a really long table-cloth over both of them so it looked like one long table. She had me put little cards with people’s names on them at all the places. It was like this: one family person, one guest person, one family person, one guest person. My mother always sat at the end of the table that was near the pantry door. My father sat at the other end near the windows where there were no zebras outside. This entry was posted in childhood experience, Experience the Moment, love of life and tagged Chicago, early childhood experience, family life, NaBloPoMo, NaBloPoMo November, The Dining Room. Bookmark the permalink. I think, though I’m not absolutely positive, that the unidentified lady is a very young Giddy Dyer. Cameraman would have been Bob Dyer.